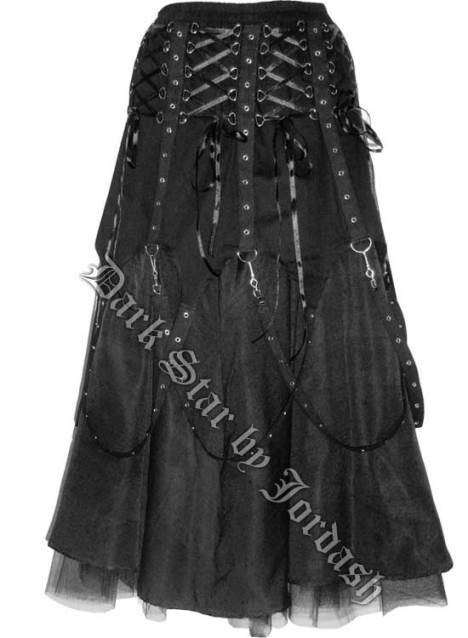 Reviews: Dark Star Black Chains Gothic Skirt [DS/SK/7032B] - $129.99 : Mystic Crypt, the most unique, hard to find items at ghoulishly great prices! This skirt is wonderful and the pictures do not do this item justice. The fit is a bit different than one would expect being as the waist is cut a bit small. Everything else on the skirt flares out though, very roomy, comfortable, and attractive to those that can appreciate the old century dress style. It flows somewhat as a petticoat but is stiff enough at the bottom to be safe to wear on a very windy day. The ribbons simply make the skirt gorgeous and the canvas overlay removes the dainty appearance of this skirt. Over all I am extremely pleased with this item.